Scoring goals were the least of Ferris State’s worries over the weekend, as they notched two convincing victories over Ohio State. Friday’s game looked like it was just out of a video game, with the Bulldogs jumping out to a 3-0 lead right out of the gates. Senior Blair Riley (pictured) initiated the scoring surge with a short-handed marker at the 5:11 mark of the period. Along with defenseman Scott Wietecha, Riley helped up the lead shortly thereafter by assisting on a Cody Chupp power-play goal. Ferris State’s final score of the first came off a backhanded shot from the left faceoff circle by junior Mike Embach that snuck past Buckeyes’ goaltender Cal Heeter. Ohio State would break their scoring drought just 54 seconds into the ensuing period on a marker from Zac Dalpe. The Bulldogs however would remain unfazed, rattling off four more goals through the remainder of the period. Freshman Travis Ouellette queued-up the next scoring wave with a marker on the man-advantage that was set-up by juniors Zach Redmond and Wietecha. After surrendering four goals on 13 shots, Heeter was sent to the bench in favor of back-up Dustin Carlson. 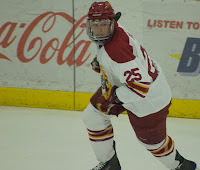 Riley scored the next two goals for Ferris State to notch his second career hat trick, followed by a lamp-lighter from freshman Matthew Kirzinger to close out the middle stanza. Ahead by a 7-1 margin, Bulldogs’ head coach Bob Daniels saw no reason to keep netminder Taylor Nelson in the game, so he was replaced by senior Jordan Barber to begin the third. With less than four minutes remaining, Ferris State sophomores Jordie Johnston and Brett Wysopal garnered assists on a goal by freshman Eric Alexander. The combination of Nelson and Barber totaled 26 saves, the same amount as their counterparts. Of the Bulldogs' eight goals, four came off the power-play. Ferris State’s chances for a repeat performance looked bleak on Saturday, but they capitalized on some key opportunities late in the game to pull out a 6-5 win in overtime. The Buckeyes came out with a vengeance, holding a 3-0 lead at the end of the first period, followed by a 4-2 affair after 40 minutes of play. With Dalpe upping the score to 5-2 just minutes into the third, Ferris State rallied to score three goals over a 13 minute span to force overtime. Chupp initiated the Bulldogs comeback with a power-play goal at 5:42, and tied the game while on the man-advantage with 51 seconds remaining. Sandwiched between the two scores was a marker by Riley, his 12th of the campaign. The contest looked to be headed to a shootout until senior winger Casey Haines notched the game-winning goal with 22 seconds left in overtime. Once again, Ferris State’s power-play was in full swing, converting on four of six opportunities. Junior Pat Nagle and Nelson combined for 21 stops, compared to Heeter’s 37. The Bulldogs (9-3-2 overall, 4-2-2-2 CCHA) have the week off before returning on December 4-5, when they host Nebraska-Omaha.